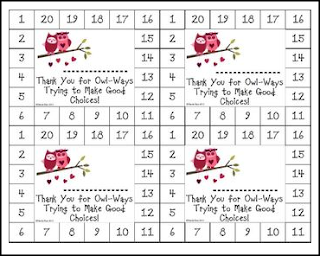 These cute Valentine's Day-themed behavior cards can be used to motivate a wide range of students. When students accomplish a task or other goal, simply punch a hole in a number on the card. Don't want to use a hole punch? You can also use a unique stamp, or sticker. 3 pages of information on how I have used these cards to encourage good behavior in my own classroom, and suggestions and tips! 3 differentiated behavior cards (5 boxes, 10 boxes, and 20 boxes). NOTE: This product does NOT provide a complete behavior management system. Rather, it will supplement and enhance the system you already have in place. Behavior Card Themes Available in my Store: Owls, Beach, Zoo Animals, Pirates, Christmas/Winter, Halloween, Fall Themes, and Robots.